By Dale Johnson Posted: July 14, 2017 3:45 p.m.
A group of international scientists has new evidence that the Earth is warming up at an unprecedented rate. The new data provides the most complete look yet at climate changes during the past 2000 years. In all, 98 scientists from around the world are taking part in the research project – including Dr. David Sauchyn, Professor in the Department of Geography and Environmental Studies at the University of Regina. “The data clearly show a long-term cooling trend until the 19th century, which is then followed by a sharp warming. This recent rapid warming is consistent with the large body of scientific evidence of anthropogenic global warming. The importance of our study is that we were able to place global warming, and recent weather observations, in the context of the past 2000 years,” Sauchyn explains. He helped with the research and writing of the findings that were published in the journal Nature Scientific Data on July 11, 2017. The rings in trees tell more than just the age of the tree, because trees often grow more in warmer years than in cooler years, creating rings of different widths depending on the weather they encounter. Sauchyn has been collecting tree samples for years, as part of his research into climate change. 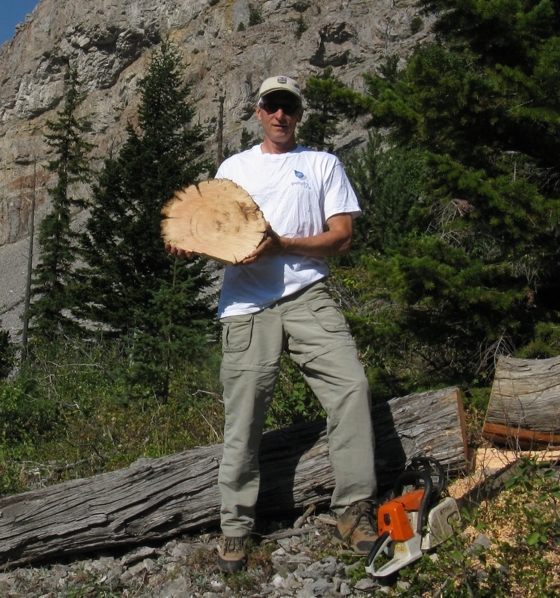 “In our Tree-Ring Lab at the U of R we have more than 6,000 samples of old wood. It has taken my grad students and I about 25 years to collect this wood and extract information about the annual climate of the past millennium. But this effort has paid off since we are able to reconstruct the past climate of the Canadian prairies and contribute to global studies of climate change,” he says. Sauchyn says it’s important for the U of R to be involved in such international research projects.